The completion of Stage 2 of Lynden Pindling International Airport's redevelopment will help spur economic growth in tandem with other projects throughout the country, Prime Minister Perry Christie said during a ceremony marking the occasion this week. Pictured: Arriving JetBlue travelers found an entirely new International Arrivals Terminal, unveiled on October 16, 2012 at Lynden Pindling International Airport in The Islands Of The Bahamas. Improvements were made to the terminal's physical space, services and amenities as the second stage of a planned three-stage, $409 million redevelopment of The Bahamas' largest airport. With the opening of a second new terminal, the premier airport of The Bahamas is being transformed from a drain on public coffers to a self-sustaining, modern facility, second to none in the region. “Lynden Pindling International Airport has moved from an airport that was more than a $20 million annual drain on the public purse, to one that has met expectations for being self-sustaining,” said Prime Minister Perry Christie at the official opening ceremony for the new International Arrivals Terminal October 16. The first visitors through the new facility arrived at 9:03 am on JetBlue flight 1791 from Fort Lauderdale. 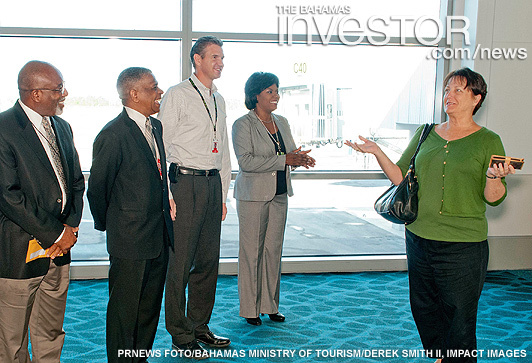 They were greeted by the executive management team of the Nassau Airport Development Co (NAD). Five years ago, NAD signed a 30-year agreement with the government of The Bahamas to oversee the airport redevelopment of LPIA. With two terminals already completed, the airport management company and Canada-based general contractor Ledcor Construction have already begun work on the final stage of construction. More than 500 workers were on site at the peak of construction for Stage 2. The impressive three-story structure has barrel-vaulted ceilings and the curved roof design mimics ocean waves. 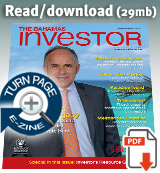 “The new LPIA has a distinctive Bahamian sense of place. The new LPIA has created opportunities for Bahamians. The new LPIA will allow for air service growth and the new LPIA will provide a world-class customer service experience,” said Stewart Steeves, president and chief executive officer at NAD. He noted that the airport management company took great care to ensure that the colours, style and the people of The Bahamas were reflected in the new airport facility. Hence, the bright open spaces, gardens with native Bahamian plants and Bahamian art work in strategic locations. “One of the most important considerations is that we are building not only a world class airport, but a lasting tribute to the founding father of our nation and architect of the modern Bahamas, the right honourable Sir Lynden Pindling,” said Prime Minister Christie. He noted that other airports throughout The Bahamas will need to be modernized and brought up to international standards commensurate with the growing needs of each island. In his opening remarks to the hundreds in attendance, the Prime Minister appealed to all who will work and maintain the airport to provide world-class service in line with the best-of-class facility. “It is only when we do this that our job will be complete and produce lasting positive results for the benefit of the entire Bahamas,” he said. Kerzner International has announced the return of Helen McCabe-Young to the company as executive vice-president, sales & marketing, One&Only Resorts. From car hire to hotel room nights, the Family Island of Abaco received an economic boost during the recent by-election as people flocked back to vote and politicians campaigned. Watch a news report here.